As temperature in Kuwait reaches 50°C (122°F), the BURGER KING® brand served a special WHOPPER® sandwich flame – grilled by the Sun. Kuwait, July 24, 2018: Can it get any hotter? It sure can! The warmest day of the year in Kuwait just hit 50°Celsius (122°F), and the BURGER KING® brand wasted no time in making the best of every ray. 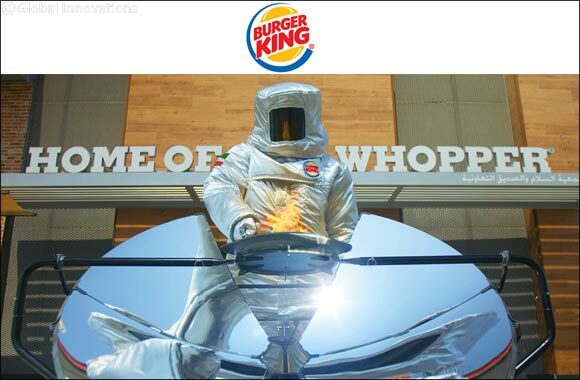 Flipping the down side of Kuwait’s infamous scorching heat through their very own solar powered gadget, the BURGER KING® brand took flame-grilling to new heights by harnessing the Sun’s power to its ultimate advantage. The result? The beginning of a tasty friendship between the giant food chain and the bright star. In July 2018, BURGER KING® restaurants in Kuwait served its 100% Sun flame-grilled WHOP-PER® sandwiches bearing the same quality and appreciation of the iconic WHOPPER® sandwich to numerous surprised guests at one of its flagship stores. The king of flame-grilling stepped in to save the day in one of the hottest countries in the world. With the temperature reaching 50°Celsius (122°F), this year, the BURGER KING® brand in Kuwait transformed the current sentiment into a sunny side up experience by beating the heat with fun and positive comebacks, proving that Kuwait summers don’t have to be boring.